A Southern Grace: why didn't i think of that? I missed the boat on National Peanut Butter and Jelly Day, but I made up for it this morning. 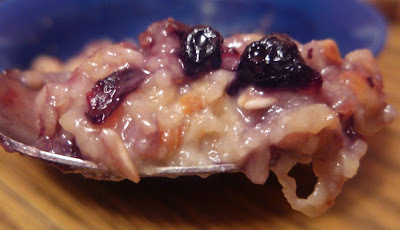 I happily stumbled upon The Peanut Butter Boy's Peanut Butter and Jelly Oatmeal and got inspired. It's such an obvious combination, but it truly had never occurred to me to make it. Be honest, how many of you have actually eaten it? Eh, it could very well be that I'm just completely oblivious and unworthy of being associated with foodies. Here's the bevy of ingredients involved in this masterpiece. I used my delicious blueberry preserves because ever since I saw this Wild Blueberries & Cream Tart by Emiline, I've been deeply craving blueberries. Technically, preserves and jelly are two completely different animals, but dang it, I wanted blueberries. Don't judge me. I was delighted by this breakfast. It was a little bit sweet, a little bit salty, a little bit smooth, and a little bit crunchy. Verily (yes, verily), a party in the mouth. I thank you, Peanut Butter Boy, for slapping me upside the head with this stellar mishmash of flavors. I've yet to experiment enough with peanut butter. I made some cookies, but to me they were horrid. Everyone else seemed to think they were ok. I have to have another date with peanut butter soon again. Did you save me a spoonful? 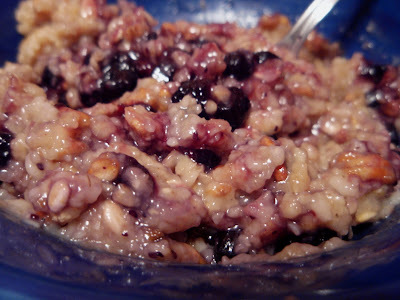 Please don't yell at me for going to SuperWalmart's...but I have found an incredible oatmeal there...made by Sturm's...comes in Blueberry or Cranberry...it's whole grain with the addition of Flaxseed and Steroids....oh...and no sugar added (contains phenylalanine), so my diabetic husband can have it...yes, it does say naturally and artificially flavored...but it's lower in sodium than most (90 mg a serving) and higer in fiber (Dietary 6g, Soluble 4g) and has 4g of protein. I'm wondering if it would work as well as the Kashi? *Bow*. I'm glad I could be of service =). I love Kashi and all their products. 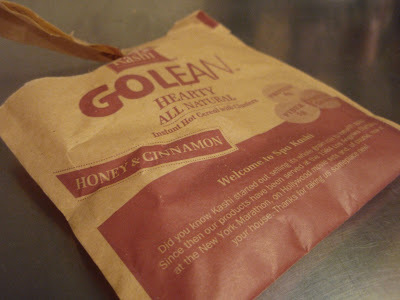 The oatmeal is good, but I love their Go Lean and Go Lean Crunch cereals. 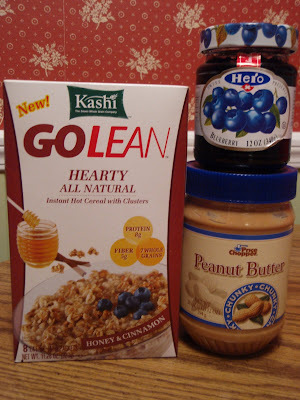 The Go Lean is a little bit healthier but the Go Lean Crunch tastes unbelievable. I buy a box of each and mix them together in a bag and use that in yogurt and things. So you liked it with the blueberry? I've used blueberry jam and it's good but I think the blueberry flavor gets lost a little bit, although I guess it depends how sweet your jam is or how much you use. Or maybe I'm just chemically, physically and psychologically addicted to strawberry. I declare that you've made up for missing PB&J day. It actually looks perfect to me! This is the sort of thing that most people would say, ewwww. I haven't watched the finale yet. It's coming on at 1 AM and I'm going to watch it. 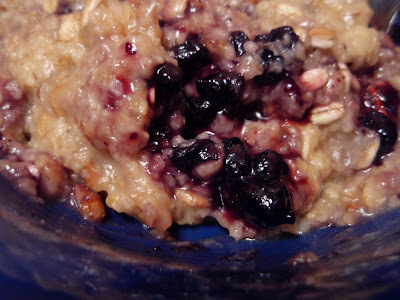 I've done peanut butter in my oatmeal and adding jam sounds like a great idea! we had a nat'l peanut butter and jelly day? Blast! I missed it and I love PB & J!! Oh and that dish you show looks delicious!! 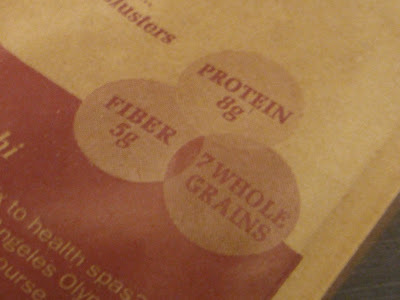 I'm not an oatmeal fan but I must admit that I would like to try pb&j oatmeal!